Oh it’s that time again…time for another Create with Connie and Mary Thursday challenge and we have an interesting color challenge for you: Cucumber Crush, Pacific Point, Tangerine Tango. I do have to say…Cucumber Crush is a bit ‘challenging for me. It just such a BRIGHT green and although I LOVE greens…this one, well, not so much. I struggles with how to use it but I do have to say…this turned out pretty goo. Besides the Stake Your Claim set…can you tell where the hat and dots came from? If you guessed No Bones About It…you are RIGHT!!! I had that ‘sitting on top of my desk’ form a project and thought it would be fun paired up with the Stake Your Claim. Color large and medium Perfect White Accents with orange sharpie. Add to finish card off. Not only is the JULY 15 Mini Session open BUT Connie and I are starting to add our additional cards! So, do you want to have access to some GREAT ideas using products from the new catalog? Check out out! This entry was posted in Create with Connie and Mary and tagged No Bones About It, Stake Your Claim. Bookmark the permalink. Well, for not being a Cucumber Crush fan you sure hit this one out of the park! You have such an eye for putting fun elements together! The little birthday hat, the blue dots and the sparkling strip all work together amazingly! Such fun!!! What a fun modern collage combo! 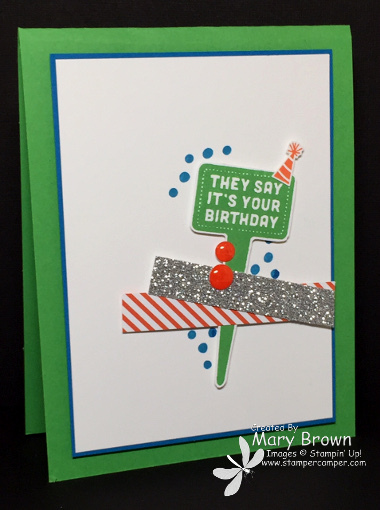 I LOVE Cucumber Crush – I so lamented the loss of Gumball Green but I’m happy now with the arrival of this fresh colour; with card creations like this, I’m sure you’ll learn to love it too! What a clever combination of stamps and elements! Super cute and I love that jaunty, little, party hat! Such a cute out-of-the-box approach to this color combo! So you just “happened” to have that other set out… what a happy happenstance!! Fun and happy card! CAS but so fun and festive with the glimmer paper and accents!